The last few months have been hectic at the st ation with both the inshore lifeboat Charles Dibdin & hovercraft Hurley Spirit in action on a regular basis. At the time of writing this we have had over 40 ‘shouts’ so far this year. These combined with our extensive and on-going training programme have kept our volunteers fully occupied. 5th June – rescue of a badly injured & unconscious person in the area of ‘Wigg Island’ nr Runcorn – We carefully transferred him to the lifeboat, gave oxygen, first aid and monitored his condition. We transferred him to the RAF rescue helicopter near Liverpool Airport and he was flown to Aintree Hospital in Liverpool for treatment. Both inshore lifeboat and hovercraft were called out. 7th July – recovered and secured and fishing vessel that had lost its mooring and was a potential hazard to shipping in the river. 16th / 17th July – The Mayor of Wirral visited the station on the Saturday and in the evening the hovercraft Hurley Spirit was in action to assist an injured kite surfer. 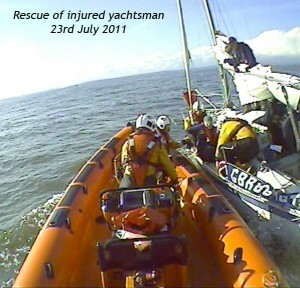 On the Sunday we launched in severe conditions on a call out to a yacht with engine failure. 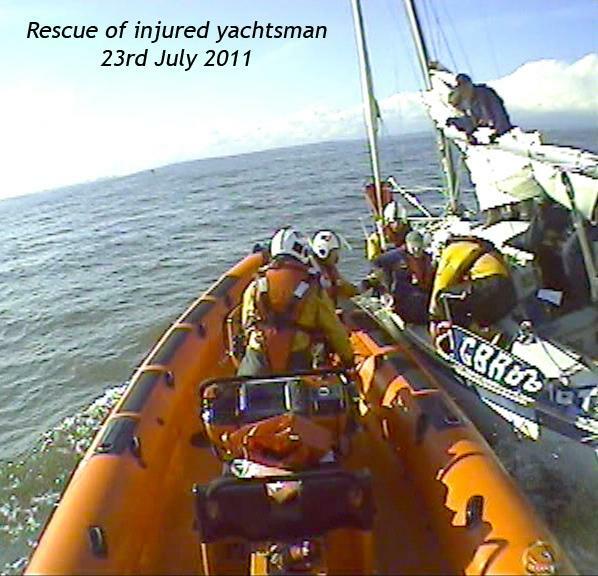 23rd July – the Charles Dibdin was launched to assist a yachtsman in Liverpool Bay with a severe crush injury to the foot. 30th July – We responded to the report of a large silver object falling into the sea off New Brighton. We recovered it and unfortunately it turned out not to be of alien origin but a group of party balloons tied together. Our hopes of being the first RNLI station to have an alien encounter were dashed!. 31st July & 7th August – our volunteers performed ‘man overboard’ recovery demonstrations to appreciative passengers on board of Mersey ferry’s on charity cruises. We have had other call outs but these ones have featured in the press. For more information on these and other rescues please have a look at www.rnli.org.uk web site select the ‘In Your Area’ tab and go to New Brighton lifeboat station. There you will find press reports, photographs and now videos of these and other activities at the station. New Brighton Heritage and Information Centre. The New Brighton Heritage and Information Centre at number 90 Victoria Road was opened by the Mayor of Wirral, Cllr Moira McLaughlin,on Saturday 16th July. 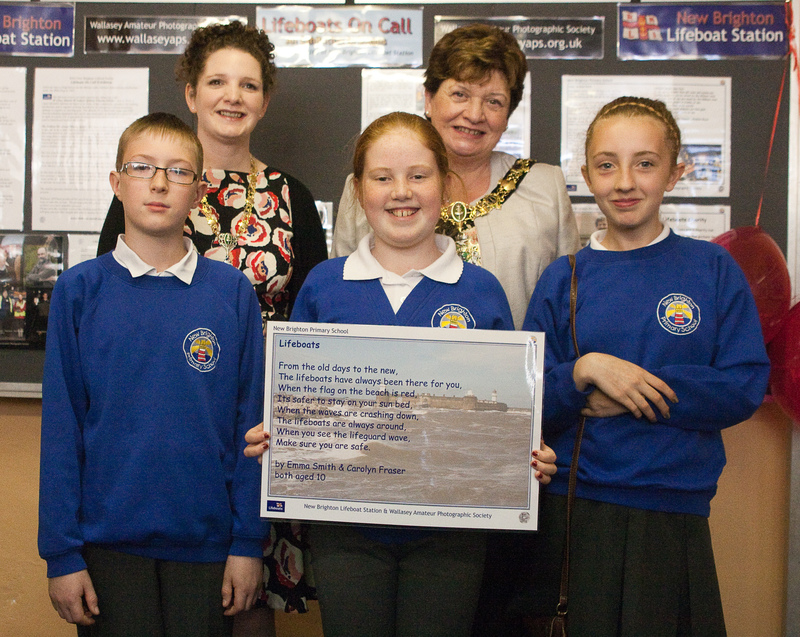 We are currently showing part of the Lifeboats On Call 24/7 photographic exhibition – a project undertaken by the Wallasey Amatuer Photographic Society together with the children of New Brighton Primary School showing a year in the life of the New Brighton Lifeboat Station. 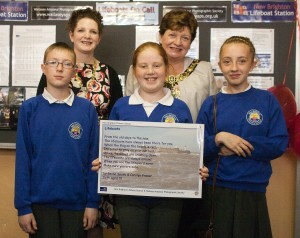 Seen here are 3 of the school’s pupils – Niamh King, Carolyn Fraser and Matthew Brown showing their work to the Mayor. The Centre hopes to gradually gather an exhibition of New Brighton’s fascinating history with the help of those people in the community who have New Brighton memorabilia which they wish to display. We would be grateful if anyone who has such memorabilia would contact the Project Manager, Cathy Elwin, at the Centre on 639 3555 to arrange for it to be displayed. The Centre is manned by volunteers and we would like to hear from anyone who can spare a couple of hours each week to help with this. Our thanks to everyone who has been involved in getting the Centre up and running and to the many people who have visited it so far to talk to us about New Brighton past, present and future and who have left their helpful comments in our Visitors Book. If you haven’t visited the Centre yet, please come along and tell us what you think and give us your suggestions as to how you would like to see it developed. Opening times are 10.30 am till 4 pm Monday to Saturday and 11 am till 3 pm on Sundays. We’d also like to thank all those volunteers who deliver the Walrus every March, May, September and December. We’ve been doing this now for 16 years and consider it to be a great community achievement. If there is anyone out there who could spare some time to deliver a few we’d be glad to hear from you – ring 639 5798 or email rustyk92@sky.com. The deadline for articles to go in the December Walrus is Friday 18th November. There have been a number of recent burglaries on the Wirral, where the offenders have gained access to properties via the Upvc front door. These have occurred where householders have inadvertently left the front door insecure, by failing to lift up the handle engaging the multi-locking system, and then turning the key. In other instances, the burglars have inserted an implement through the letterbox to release the door handle, or used a thin screwdriver between the door and frame, to release the door latch. Never leave keys in door locks. These should be taken upstairs, along with any car keys, during the nighttime. If your front or rear doors are of Upvc construction, it is imperative to ensure that the bolts are activated, and the lock is engaged with the key at all times, to prevent these walk-in/sneak burglaries. The latch itself will not provide adequate security, and this has been clearly illustrated over recent months. 20% of burglaries that take place involve no forced entry, i.e. the burglar gains access via an open window or door. It is obviously important to ensure all windows/doors are secured when leaving the premises unattended. Opportunist burglars will often take advantage of doors and windows, left open by the householder for ventilation, in the warmer summer months, even when the house is occupied. The Bards of New Brighton exists to promote appreciation of poetry and to encourage people to write verse and read it out in front of a supportive audience. The club, which has an open membership and charges no admission fees, meets on the second Monday of each month in the back room (the folk music room) of the Magazine pub in Magazine Brow, New Brighton. The Bards were formed by local writer and journalist Steve Regan, of Victoria Road, nearly five years ago. For a while the group met in the Ginny (Little Brighton) pub but eventually moved to the Mags because it offered a bigger room. All sort of poetry is read out at the Bards’ nights – humourous, political, spiritual, locally-themed, philosophical, and, of course, love poetry. The atmosphere is lively and friendly. Whoever is compere on the night will often compliment you on your poetry, and there is a lot of friendly banter between the local poets. These days Steve Regan is helped in the running of the Bards by Dave Costello, who lives in Liscard. 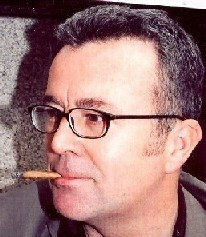 Dave recently won first prize in the prestigious Welsh Poetry Competition. The two men say they have been encouraged to see people grow in confidence and eloquence after coming regularly to the Bards of New Brighton to read, or “perform” their poetry. Each poet gets to read in a four minute slot, and those who have a bit more to read will be given two such slots if they so wish. 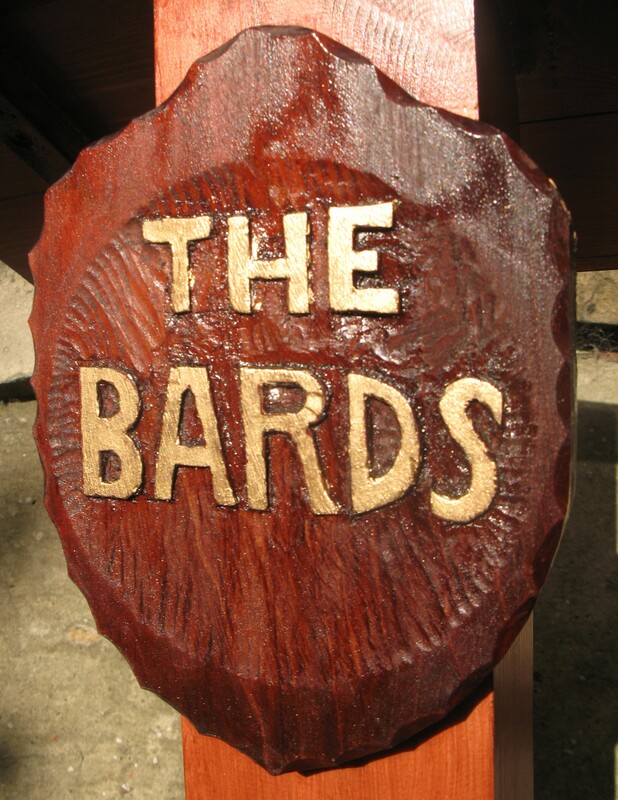 So successful has been the Bards’ open and democratic style of performance poetry, that Steve and Dave have started a sister club in Liverpool, called The Liver Bards! This also offers open-floor live poetry – in the upstairs concert room of the Ship and Mitre pub, Dale Street, Liverpool city centre, L2 2JH. The Liverpool nights take place on the THIRD MONDAY of each month, starting 8.15pm. The New Brighton Bards poetry nights at the Magazine pub starts at 8pm on the SECOND MONDAY of each month.Upcoming dates for 2011 are: 12th September; 10th October; 14th November; and 12th December. All are welcome. In days gone by New Brighton always had a tourist-trail map so that visitors could be sure of finding where all the important things were. No such map has been properly produced for many years, so New Brighton Community Partnership are now holding a competition to “bring back the tourist map” !!. Think of all the places worth a visit in the town, all the new places there are going to be and get them on the map. If you want some inspiration then visit the new Heritage Centre at 90 Victoria Road where there are some copies of old tourist maps available to look at. Entries are for under 10`s, 10 to 16 years and over 16`s. Your maps should be returned to the Heritage Centre, 90 Victoria Road by 3.30pm on Friday 30th September. Don` t forget to include your age, name and contact details. 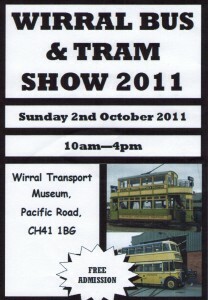 The prize for the winners will be to see their entry included in a New Brighton Map Postcard and Poster Set. Entries will be judged by New Brighton Community Partnership and “The Timelines” (who currently have a range of local reproduction memorabilia available – call in at the Heritage Centre for details). Get creating and good luck !!. (Barry Humphreys – The Timelines). It’s almost two years since the new Floral Pavilion opened its doors in December 2008 with a classic comedy performance from Ken Dodd and the New Brighton theatre and conference centre continues to go from strength to strength. The autumn sees yet another star-studded line visiting the much loved seaside resort with everything from Rolling Stones legend Bill Wyman, family favourites Mr Men & Little Miss and Peppa Pig, to the Wirral debut of the classic musical Blood Brothers courtesy of Bill Kenwright Ltd. The enviable location on the very tip of the peninsula and its panoramic views across Liverpool Bay have seen the theatre grow in popularity as the perfect place to meet for a coffee, enjoy a meal or even tie the knot! Everyone at the Floral Pavilion are looking forward to welcoming faces both old and new over the coming months. Did you know that the Community Centre Computer Suite which has 12 PCs is offering free online services (for the first half hour, then 50p every half hour after) to local residents who are searching for work or have maybe been made redundant in the present recession? To enable local people to take advantage of new job/training opportunities in the Wirral through a job ready program that develops their job search, interview, application and CV writing skills. First Time Online Taster Courses, including BBC Web wise. CV advice & online courses. Local residents will be able to meet people in a similar situation to them and solve problems together. Why not pop in and chat to our friendly staff that will be able to advise you on the services available. 12.30pm and the Church is open for prayer. Looking for something to do on a Thursday Morning? 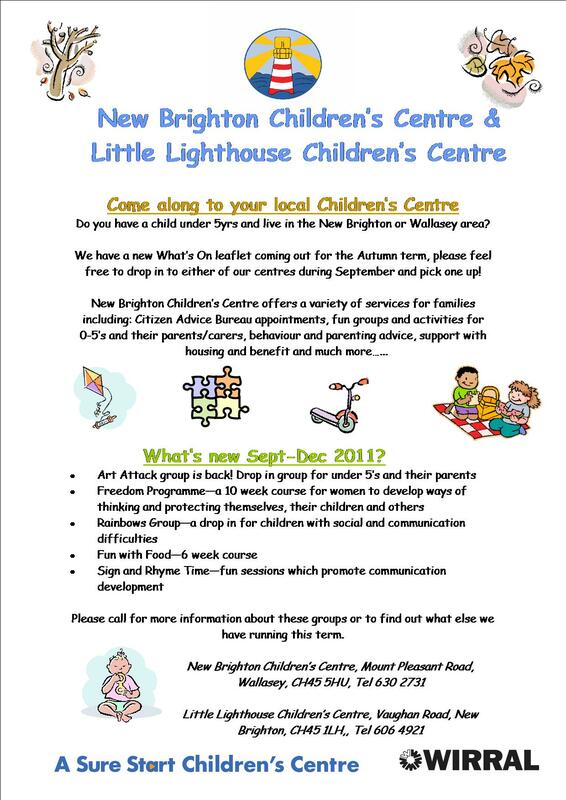 Come to our carer and baby group. Birth to Preschool. Chat and a friendly ear, tea, coffee, biscuits, juice, toys and crafts. Fri 30 John Hegley – Performance from one of Britain’s best-loved comic poets. Book early to avoid disappointment. Sat 1 Wallasey Central Library Centenary Celebrations – Edwardian cream teas, music and displays to commemorate our 100th Birthday! What is Zumba® in the Circuit? Take the high-energy, Latin-inspired dance-fitness moves of the Zumba® program and mix them with a series of strength exercises at timed intervals and you’ve got Zumba in the Circuit, the 45 minute workout that’s putting a new spin on circuit training. The first part of the walk will take in the Magazine Promenade & Conservation Area. After a stop for lunch at the café, we will proceed along Tower Promenade then back to the park. 20th Wallasey All Saints Rainbows and Brownies have now moved from All Saints Church to Thirlmere Drive Scout Hut. Rainbows are on Wednesday at 4.15p.m. – 5.15p.m. and Brownies are Mondays from 6.00p.m. – 7.30p.m. If you have a daughter who would like to join us or you would like to add your daughter to our Rainbows waiting list please give me a ring on 630 1519. Admission is £1.00 and includeds refreshments. This year sees the 80th year of the fantastic work of Guide Dogs, but did you know that Guide Dogs was started in Merseyside? The UK’s first four guide dog partnerships qualified on October 6th 1931 in Wallasey on the Wirral. The 80th anniversary of this milestone falls in this year’s Guide Dogs Week (October 1 – 9), Guide Dogs’ annual fundraising and awareness week. To mark this momentous occasion, Guide Dogs is hosting an event at the Floral Pavilion, New Brighton. The event will be started by a march of guide dogs, guide dog owners, puppy walkers and boarders, which is starting at the birthplace of Guide Dogs- ‘the Cliff’, in Wallasey and will lead down to the statue of the first guide dog, which is located outside of the fabulous Floral Pavilion, New Brighton. The Floral Pavilion itself will be packed with stalls, games, demonstrations, information and birthday fun, so why not join us on the 8th of October between 10:30 and 15:30? Arrive at statue for photo opportunity. November will be especially busy with a craft fair on Saturday 5th November at St Thomas church Seaview Rd Liscard, and a presentation and antique valuation evening by auctioneer John Crane at our social meeting on Tuesday 22nd. The Healthy Homes Team are working in Your Area! Wirral Healthy Homes is a new initiative run by Wirral Borough Council in partnership with NHS Wirral, Merseyside Fire & Rescue Service, Merseyside Police and a number of Community and Voluntary Sector agencies. It aims to reduce all hazards in the home that could affect your health, safety and well being. 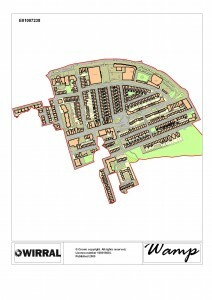 The Victoria parade area in New Brighton has been the focal point of this ground breaking new initiative that brings together Wirral Borough Council, NHS Wirral, Merseyside Fire & Rescue Service and a variety of other agencies in a new holistic approach to improving home safety, health & wellbeing. 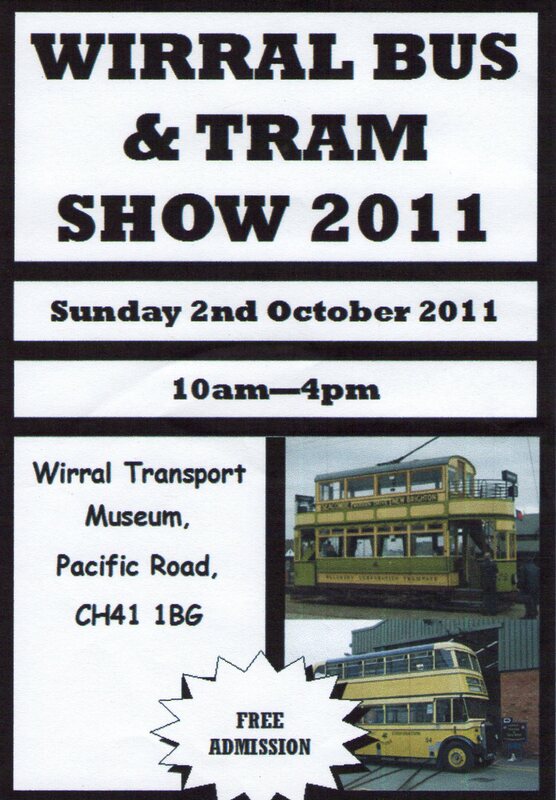 Due to its success, the service has now been rolled out to the rest of New Brighton.